I still have very fond memories of the tasting menu I had at Lamesa Filipino Kitchen a year and a half ago. 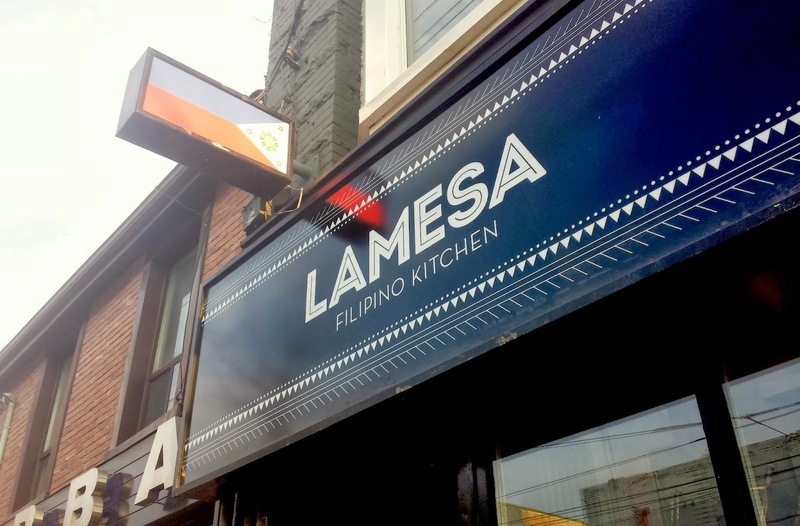 I remember describing it as a "rock-solid meal" which is why, to this very day, I still recommend this Queen West restaurant to my friends whenever they are looking for something different. Something unique. Speaking of bar, I enjoyed several cocktails that evening. My favourite would be this classic hip hop inspired Lolo Cool J cocktail which consisted of ginger, bourbon, pineapple and cinnamon syrup, lemon juice, and ginger ale. Live music throughout the night courtesy of DATU. These guys are fantastic. Before dessert we learned that not only is head chef Rudy Boquila passionate about food he is also passionate about music. As a producer / musician / DJ, Boquila has produced some classic Toronto tracks (he also has a massive record collection to boot!) and as a chef, he started at the Bamboo and went on to work at Oyster Boy and the Gladstone Hotel. Chef Rudy also spent some time cooking on tour with Live Nation for groups like U2, Bon Jovi, AC DC, Aerosmith, etc. After the performance it was time for dessert! We each made our own Halo-Halo at the Halo-Halo station. Call me bias but I knew I was in for a treat even before this media night because if the tasting menu a year and a half ago is any indication of what Lamesa is capable of then I knew I'm in good hands. As expected (and 'cause I'm always right) Boquila's new menu did not disappoint. He has thoughtfully applied the traditionally sweet, sour and salty flavours of Filipino food with ingredients that we are all familiar with, then works his magic to create some very delicious fusion plates. I thought the Fil-Can brunch items were especially fun and whimsical, such as Boquila's version of the French toast which had bread, plantain and jackfruit all wrapped in spring roll. Amazing! His savoury pancakes topped with tender braised pork was equally stellar. One of my favourite dishes at Recipe For Change 2014 was Lamesa's Arroz Caldo so I was really happy to see it at the new menu launch. Similar to congee, this smooth rice porridge is so warm and comforting (hangover brunch item?) One thing's for sure, I will need to revisit Lamesa for their chicken adobe! Seriously that one bite of fried chicken left me hanging; it was so tasty I wanted 10 more (note to Lamesa: it's really cruel to serve just one bite of fried chicken like that...it really is!) As for the Halo-Halo I've already raved about it last time but this time was extra fun because we got to make our own :) However, what I really need to try next is their Ginataan Sundae, a beautiful concoction of ube, tapioca, brown butter polvoron, caramel corn, and coconut whipped cream.